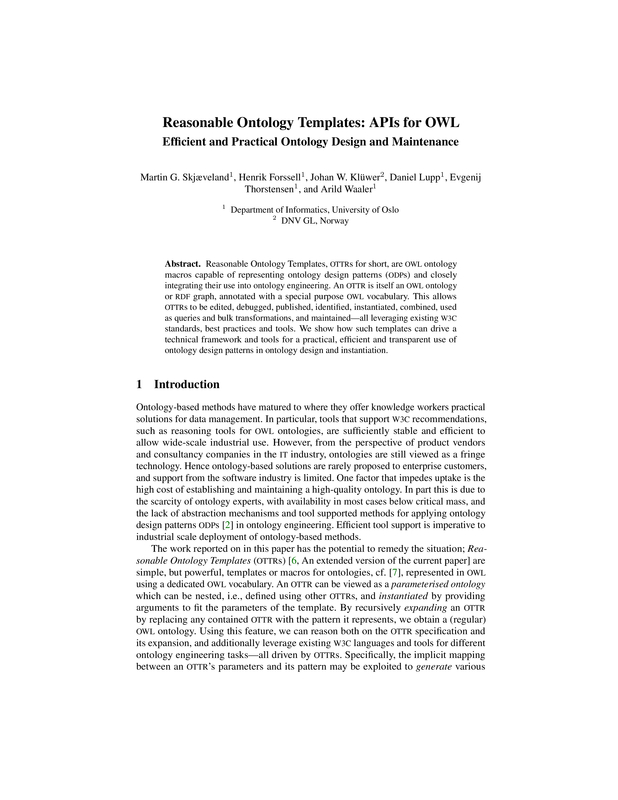 Reasonable Ontology Templates, OTTR s for short, are OWL ontology macros capable of representing ontology design patterns ( ODP s) and closely integrating their use into ontology engineering. An OTTR is itself an OWL ontology or RDF graph, annotated with a special purpose OWL vocabulary. This allows OTTR s to be edited, debugged, published, identified, instantiated, combined, used as queries and bulk transformations, and maintained—all leveraging existing W3C standards, best practices and tools. We show how such templates can drive a technical framework and tools for a practical, efficient and transparent use of ontology design patterns in ontology design and instantiation.